I have personally known Dr. Heiko Bittmann for many years and have watched with keen interest as he meticulously studied the history and evolution of Budo, of which Karatedo is a part. A longtime foreign resident of Japan his insights are nothing short of amazing and, in my opinion, he's a perfect example of a Scholar Warrior. Finally translating the main parts of his original German PhD dissertation on Karatedo, this work is now available in English and is hugely significant. It's certainly a MUST-HAVE for any researcher along with all followers of traditional karate serious about learning the true history of Karatedo. I highly recommend this book and any others that Dr. Bittmann may write. The book is well researched using Japanese sources with extensive notes, bibliography, glossary and index. An excellent insight into the origins of Japanese Karatedo, with information that cannot be obtained elsewhere in English. I just want to tell all the budôkas of Okinawan and Japanese martial arts: If you are looking for a great book to enlighten your martial arts knowledge then you need to read "The Teachings of Karatedô" by Heiko Bittmann. Insights to our past! Great masters who made it: Funakoshi, Miyagi, Mabuni, Ôtsuka and more .... This book is deep in knowledge ... you cannot beat the price! The book entitled The Teachings of Karatedo by Heiko Bittmann presents a thorough analysis of four 20th-century teaching texts by the karate masters Funakoshi, Miyagi, Mabuni and Otsuka. Bittmann selected these authors due to their status as "the founders or influential masters of today's four major schools" on the Japanese main islands. 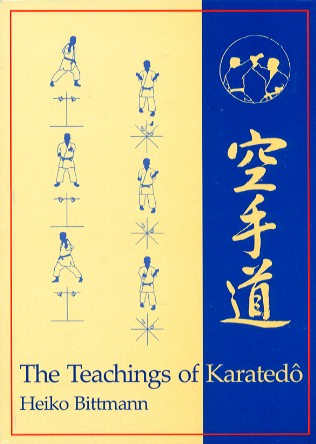 The teachings within the selected texts cover many aspects of karate training and philosophy. Technique is not the focus. I found tremendous value in the compilation and comparison of the writings of the masters that this book provides. Early documents of this type are uncommon and Bittmann makes this information easily accessible. Furthermore, he provides nice discussions to understand the lessons and precepts of the masters, which require careful thought to appreciate. He points out that there is a consistency and relevance amongst the teachings of the different masters that transcends particular schools and, in some cases, karate itself as one martial art among many. Bittmann also provides an interesting historical perspective with which to understand the teachings of the masters. In particular, he explains how the aforementioned karate masters took what had been a very secretive art (with almost no documentation) and began teaching karate openly in mainland Japan during the late 19th and early 20th century. Bittmann discusses the extensive influence of Japanese culture on the formation of dojos, and on the philosophical and pedagogical aspects of karatedo. The book is well researched with many references and useful notes. I enjoyed this book and I believe that it has helped to enrich my understanding of karate. I would recommend this book to anyone interested in the history or philosophy of martial arts, and especially to students of karate (though probably most appropriate for dan-ranks). As I prepared to promote, I was given sage advise from the Shihan of our dojo to embrace this promotion with a sense of seriousness. With that, I embarked upon a reading regimen that included the Teaching of Karatedo. It provided greater clarity as it relates to my practice that has always included Bunbu Ryodo. It was truly inspirational and illuminating. It will be a text I plan on reviewing repeatedly in my lifelong quest of Karatedo. Thanks immensely to Dr. Bittmann. In short: Bittmann’s work is readable and well researched, as well as being an important and serious contribution, not only regarding the teachings of the Way of the Empty Hand, but also concerning the historical development and the roots of the basic principles of the Martial Arts. For someone who wants to know about the history and tradition of Karate-Do in detail, I recommend Heiko Bittmann’s book … which deals with this theme with great competence, and covers a lot of Japanese sources. This book is a short version of the German doctoral thesis in the field of Japanology (1998). It presents English translations of texts on the teachings of the Way of the Empty Hand together with explanations. There have been few and in some cases no English translations of these texts until now. They include the writings of the founders or influential masters of the 'four major schools', Shôtôkan, Gôjûryû, Shitôryû and Wadôryû, Funakoshi Gichin, Miyagi Chôjun, Mabuni Kenwa and Ôtsuka Hironori respectively. However, these texts also provide insight into the fundamental way of thinking within the traditional Japanese Ways of Martial Arts as a whole. To give a background to the texts and to allow a deeper understanding of them an account of the historical development of the Japanese martial arts, an introduction to some important basic principles - such as 'Way' - dô, 'Emptiness' - kû and 'Form' - kata - and a discussion of their written transmission, including new translations of important teaching texts of Miyamoto Musashi, Yagyû Munenori and Takuan Sôhô, are also presented. Biographies of the aforementioned Karatedô masters and commentators on their texts which serve to illustrate one of the most important developmental phases in the history of Karatedô are included as well. The Appendix considers the 'respectful salutation' (rei) and its performance in connection with the Way of the Empty Hand. In addition, those interested in further study will find comprehensive notes as well as both an extensive bibliography and a glossary of terms and names with their Japanese and Chinese characters.